Vollrath’s Cayenne Gas Griddles provide a simple and effective way to prepare food with that delicious restaurant flavor in an economical, safe and hassle-free way. These griddles are ideally suited for use in steak houses, restaurants, coffee shops, clubs and pubs. 12" wide heating zone per control. 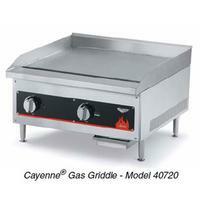 Griddle, Countertop, Electric, 24" Wide, 1/2" Griddle Plate, Thermostatic Control Every 12"